My first visit to Canada last year was full of excitement and my son tried to make it special in every respect. He froze loads of blueberries for us as it would have been out of season by the time we reached there. I was obviously excited to try out Neel’s ice cream maker. Read the instructions properly, browsed the internet to know to use frozen fruits to make ice cream. There was no one recipe I followed, took what I thought would work for me from here and there and made soft serve blueberry ice cream. My son and hubby were excited but I was like a little kid, over excited. We couldn’t even wait to put the ready ice cream in the freezer to let it set a bit more. Soft serve it was for dessert. I really couldn’t believe how easy it was to make the ice cream. The left over ice cream was put away in a freeze proof container and into freezer. The next day in our excitement to have the ice cream we forget to a picture of the well set ice cream.I will have to wait for my next trip to Montreal to post a better picture of the ice cream. I cannot make it here as we do not get blueberries. Originally called Ville-Marie, City of Mary, Montreal got its name from Mont Royal (Mount Royal), the triple peaked hill that is the heart of the city. Its visible from most parts of Montreal, and looks beautiful when the trees are full of colourful leaves. 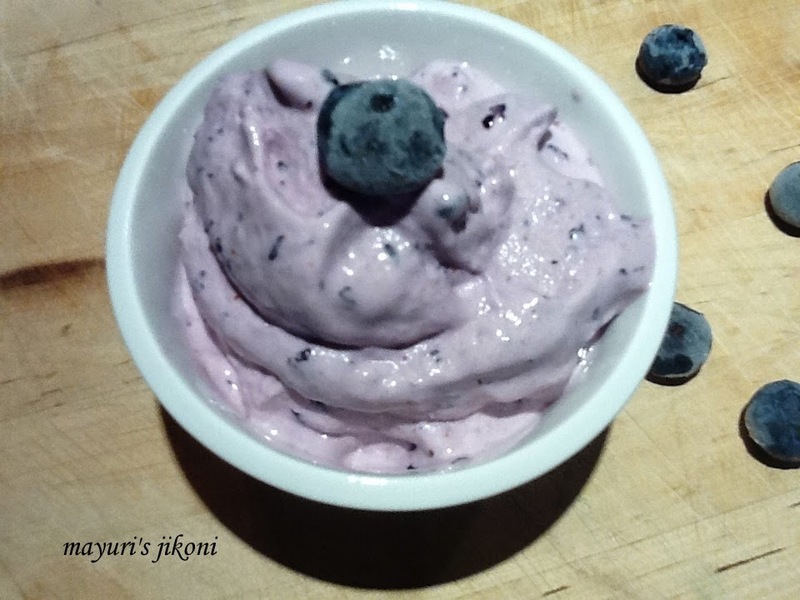 Coming back to the recipe, as I promised when I posted the strawberry frozen yogurt recipe that I will share the blueberry ice cream recipe, so here it is. I love blueberries and this is definitely is one of my favourite ice creams and hope you love it. Put berries, milk and sugar in a blender. Process till the berries are crushed. Add salt, cream and vanilla extract and process for a few seconds. Pour the mixture into the ice cream maker bowl. Switch it on and let it churn away till the mixture is solid. The ice cream maker my son has takes between 20 to 25 minutes. Serve immediately or store in a freezer proof container in the freezer. Make sure the ice cream bowl is the freezer till required. Usually they recommend to leave the empty bowl in the freezer for 8 to 12 hours before using. Remove the bowl from the freezer only when the mixture is ready. The mixture should be chilled. Processing frozen fruit with milk, cream and sugar, makes it pretty chilled. Read the ice cream maker instructions well. If you are going to use fresh blueberries, then you will have to put the processed mixture in the fridge till it becomes really cold. This takes about 30 to 45 minutes. For a more creamier ice cream use cream with more percentage of fat. I used the 2% one.